This is a guest post from Robert Brokamp of The Motley Fool. Robert is a Certified Financial Planner and the adviser for The Motley Fool's Rule Your Retirement service. He also has a newly reinvigorated blog, and you can have your day interrupted once or twice by his Twittering. 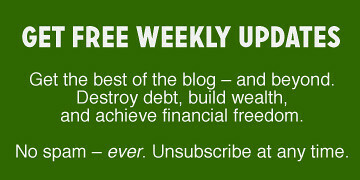 Robert contributes one new article to Get Rich Slowly every two weeks. How would you like $4,290,387? It's easy! Just go back to 1972 and invest $100,000 into a well-diversified portfolio. Not enough money for you? Well, then, here's how you can add $334,124 to that tidy sum: Simply rebalance this well-diversified portfolio annually. Okay, despite my fondness for Marty McFly, there's no way to travel back 38 years and open a brokerage account. But the past few decades may provide clues about the next few, especially regarding portfolio behavior and the value of rebalancing. Below, we'll look at three common beliefs about rebalancing and explain whether they're true or false — and why. In case you're new to the concept, rebalancing is the process of returning a portfolio to an investor's predetermined appropriate allocation (for example, 65% stocks and 35% bonds). A balanced portfolio is key to ensuring steady, growing returns, but the movement of various investments over time can cause that initial, balanced allocation to change; assets that have done well become a bigger piece of the pie, while the laggards shrink to a smaller portion. Historically, broad asset classes tend to (but don't always) revert to the mean, which is a fancy way of saying that the best investments over the past several years will often be among the worst over the next several years, and vice-versa. By rebalancing a portfolio, you're aiming to sell hot investments before they turn cold, then use the proceeds to buy investments that are warming up. Doing this ensures that every asset remains represented at the level you find appropriate. Let's examine the behavior of stocks since 1972, a period during which the market had its share of hard times. The decline of the “Nifty Fifty” stocks during the market crash of 1973 and '74 was at the time the biggest drop since the Depression, and during the “lost decade” we've just experienced, U.S. stocks posted their worst 10-year return ever, including the Depression. Would rebalancing have helped during that time? Let's find out. Join me in the plutonium-powered DeLorean and travel back to the year Al Pacino's horse head beat out Jon Voight's pretty mouth for the Best Picture Oscar. We'll examine how this portfolio performed from 1972 (the first year with reliable numbers for each asset class) through the end of 2009, and compare the returns under two scenarios: one in which it is never rebalanced, and one in which it is rebalanced annually. We'll then compare our back-tested portfolios to the S&P 500, since the typical American portfolio is dominated by S&P 500 stocks. But first, let's put our guinea-pig portfolio under the microscope to see what history has to say. Armed with these numbers, we can prove or disprove our three basic principles. True or False: Rebalancing Always Significantly Improves Returns? At first glance, the extra return gained from rebalancing our case-study portfolio doesn't appear extraordinary: a mere 0.2% a year. However, the rebalanced portfolio is worth $334,124 more than its counterpart — an amount that is more than three times the original investment. And who wouldn't want an extra $330,000 for about an hour of work a year? It just goes to show how earning a tiny bit more, compounded over decades, can really pay off. We see this even more when comparing the annually rebalanced portfolio to the S&P 500, which earned 0.7% less a year but grew to “just” $3,622,187. The diversified, rebalanced portfolio was worth $1,002,324 more — that's a 27.7% increase. Shazam! The benefit of rebalancing during the '70s, '80s, and 2000s was higher than the 0.2% annual increased return observed over the entire 38 years. But the 1990s were a different story; during that time, rebalancing actually reduced returns. That's because U.S. stocks, particularly large caps, were on a tear through most of the decade. Rebalancing in those years would have required investors to sell those asset classes before they had run out of gas, then buy lower-performing assets like international stocks and Treasuries — which posted less than half the return of U.S. stocks during the 1990s. However, U.S. stocks got their comeuppance (actually, come-down-ance) in the 2000s. One reason the benefit of rebalancing has been greater over the past decade (1.3% per year, on average) is that the rebalanced portfolio entered the 2000s with lower exposure to U.S. large caps, meaning it was more protected when they reverted with a vengeance. True or false? False. The boost rebalancing gives to returns is inconsistent — sometimes big, sometimes small, sometimes nonexistent, depending on market conditions. However, in the long term, you can expect it to add a smidge to your returns, which could add a not-insignificant amount to the portfolio's final dollar value. True or False: Rebalancing Is About Managing Risk? Look back at the table of our back-tested results, and you'll see that the rebalanced portfolio was less risky. It had fewer “down” years — and the declines it did have weren't as bad. A non-rebalanced portfolio is subject to “asset drift,” when winners grow to take up a bigger proportion of a portfolio. We can illustrate this by reviewing the allocations of our non-rebalanced portfolio at three points: (1) at the start of our study, (2) right before the dot-com bust that began in 2000, and (3) right before the “Great Recession” crash of 2008. In each case, the portfolio became considerably more aggressive, eventually coming to hold less than a third of its targeted allocation to bonds — right before two major stock-market corrections. Mazahs! (That's the opposite of “Shazam!”) By the end of 1999, the portfolio's largest holding by far was U.S. large caps — on the eve of their worst decade ever. And by the end of 2007, more than a third of the portfolio was in U.S. small caps, the most volatile asset class in our study. A study by fund company Vanguard shows an extreme example of what can happen to a non-rebalanced portfolio. The researchers found that a portfolio created in 1926 with 60% stocks and 40% bonds would have ended 2009 with 97% of its assets in stocks. This is the opposite of the approach most investors should take; in general, your portfolio should get more conservative as you approach and enter retirement. By determining a proper asset allocation and regularly rebalancing, the investor — not the market — determines the level of risk in the portfolio. True or False: The Stock-Bond Split Is Key? If the investments in your portfolio tend to move together in the same direction and to similar degrees, rebalancing is less useful. Conversely, when those holdings don't move in lockstep, rebalancing does a better job at managing risk. In the investment world, that lockstep is known as correlation — the degree to which assets perform similarly in any given year. Broad categories of stocks — e.g., large caps and small caps, or U.S. stocks and European stocks — are at least somewhat correlated, often highly so. Stocks and bonds, on the other hand, are only mildly correlated, and most importantly, bonds tend to smell rosy when stocks stink. Thus, if the biggest reason to rebalance is to control risk (which is usually done by investing in bonds), then the most important allocation to monitor and rebalance is your stock-bond split. Let's return to our example portfolio but remove the bonds, instead adding 10% to large caps, small caps, and international stocks, and 5% to REITs. The results: The non-rebalanced portfolio posts an annualized return of 11.3% (turning $100,000 into $5,785,943), whereas the rebalanced portfolio returns an annualized 11.5% (ending with $6,328,103). Once again, we see a rebalancing bonus of 0.2% a year. However, on the risk-reduction front, rebalancing added nada. Both portfolios experienced seven years of declines of similar degrees. The three worst calendar-year declines for the non-rebalanced portfolio were 38.1%, 23.2%, and 18.2%, and the three worst for the rebalanced portfolio were 38.6%, 23.0%, and 18.7%. The rebalanced portfolio earned higher returns in the 1970s, 1980s, and — interestingly — the 1990s. However, the bond-free rebalanced portfolio slightly trailed the bond-free non-rebalanced portfolio in the 2000s — the decade when risk reduction was needed most. True or false? In general, true. Ensuring the right split between stocks and bonds can lower your risk of sharp declines — and of running out of money in the future. Enough theory! Here are some practical considerations when it comes to rearranging your portfolio. Account for taxes and other costs. If rebalancing results in big commissions or tax bills, the potential boost to returns could easily disappear. Whenever possible, rebalance in tax-advantaged accounts — such as IRAs or 401(k)s — and keep costs low by limiting transactions to no-load funds and discount brokerages. That said, don't let the tax tail wag the investment dog. Plenty of people held onto stocks in the 1990s just because they didn't want to pay the capital gains taxes. The market took care of that for them — by significantly reducing or eliminating the gains. Rebalance with contributions and withdrawals. You can gradually rebalance your portfolio with strategic inflows and outflows. If you're still working, use savings to buy more of underweighted assets (those that take up less of your portfolio than current market conditions warrant); retirees, on the other hand, should sell what's become overweighted. An analysis by asset manager and author Phil DeMuth found that selling what has performed the best over the past year could prolong the life of a portfolio. Rebalance annually — at most. Rebalancing more than once a year (e.g., monthly or quarterly) is more trouble than it's worth. You'll spend more in time, costs, and taxes to get a lower return. In technical terms, such behavior is known as “silly.” In fact, you'll likely realize slightly higher returns and lower transaction costs if you rebalance even less frequently than annually — perhaps every two to three years. For example, you could rebalance once an asset class reaches a certain level — such as being 20% below your target allocation, or 20% beyond it. Thus, if your goal is that a certain asset make up 10% of your portfolio, you'd rebalance once that asset declined to less than 8% or grew beyond 12%. What is best for you is [a plan] you will actually maintain without procrastination. Annual rebalancing is simple and cost-effective, and it takes only a little time each year to implement, which means that you are more likely to get it done. J.D. 's note: I had intended to tackle re-balancing myself next week, but Robert beat me to it. That's okay. He knows more about it anyhow. Instead, I'll chronicle the process as I try to rebalance my own portfolio. There are 39 reader responses to "Rebalancing Your Investment Portfolio". Wow! Great breakdown of rebalancing your portfolio! I am currently rebalancing mine every quarter, which should yield me even more money, assuming my more risky investments continue to increase over time. I do not understand those that completely ignore rebalancing. I guess people don’t realize that they could be missing out on some retirement money. Sound strategy in normal times. But again, don’t move your money from stocks into bonds in this economy. Bonds are not going to help you grow your wealth in an environment of ultra low interest rates, central bank bond purchases, rising inflation and default (see Europe) risks. Instead, you’re risking to lose a lot either through inflation or haircuts. Excellent article! I go by the 5% rule! If any of my assets are off this threshold, I rebalance and other times when the market is really beaten down I rebalance! I only wish my tax deferred retirement account was larger! I just read the first 2 lines and already knew this would be an excellent one. You know this is a timely article for me. I love The Motley Fool, and I generally read it daily. I also have been toying with the idea of a more involved re balancing plan, rather than stuffing my investments in target date funds. The returns have been minimal, but the time investment has also been minimal. So it appears, that if done correctly, you can certainly experience a much better balanced portfolio if you are willing to put in the time to learn and stay diligent. Thanks Robert! Actually, a significant advantage of LifeCycle (a.k.a. Target Date) funds is that they re-balance for you and with consistency. This is not the message of the article and it ignores the fact that Target Date funds rebalance for you automatically. Equally important, it does not comply with the frequent GRS advice to invest without being reactionary to short term market shifts. Refer to JD’s articles on Target Date / Life Cycle funds – they rebalance for you, allow you to “invest and forget” without worrying about shifting toward bonds as you near retirement, and (through Vanguard) are VERY low cost (e.g., .18% expense ratio). Reconsider shifting away from Target date funds, they’re an excellent option! I’d like to know a little more about how to trade-off fees from the benefits of rebalancing. Obviously while I’m still growing my portfolio it makes sense to rebalance through new investments rather than selling off old ones, but mechanically that’s a hassle with my retirement accounts– it is much easier to use their rebalance function, even though that means it will sell. The size of the costs and benefits of all this are still a mystery to me. Also it’s interesting to read to just rebalance once a year. I had read advice that said to do it quarterly, but I’d wondered if fees would eat up the gains from doing that. I’d be interested to see a professional opinion on that, too. What we’re doing right now is rebalancing with new investments across our whole set of accounts – we just did the 2011 Roth investments, and the windows for changing allocations in our respective 401ks are coming up this month and in June, so now is the time I have to figure it out! I also wonder if/how I should consider other assets in the mix – our son’s 529 is nearly all stock, and that unbalances our investments even more if I include it. this article needs more cat photos! It is true, most articles do! Cats are good at rebalancing, even after a fall. I used to get pretty annoyed at books and articles that would encourage me to rebalance without describing how to do it. Even some of my serious nerdfest asset allocation books gloss over this important topic with simple examples that don’t run up against the walls of minimum investments and inability to transfer funds between accounts. I never touch the small accounts except to make contributions. I rebalance the large accounts to adjust the totals in each asset class without running up against those annoying minimums. It works MUCH better than trying to balance each account. The most likely annualized 10-year return starting from the stock prices that applied in 1982 is 15 percent real. The most likely annualized 10-year return starting from the stock prices that applied in 2000 is a negative 1 percent real. What stock allocation makes sense in both sets of circumstances? There obviously is none. Those who rebalance remain at the same stock allocation at all times. As a matter of deliberate intent! The Stock-Selling Industry pushes rebalancing because it keeps middle-class investors heavily invested in stocks even at times when stocks offer a poor long-term value proposition. The problem with this Get Rich Quick marketing plan is that the losses that we are all suffering from following it is in the process of bringing down our entire economy. The price you pay for stocks affects the return you obtain from them. We all should be going with high stock allocations when prices are good and low stock allocations when prices are bad (as they have been since 1996)). Get Rich Quick never works in the long run. Hey, Rob. Not picking a fight here, but asking a simple question: What investments do you recommend instead? My stock portfolio is up 65% since I moved it to Fidelity in 2009. I’m about to rebalance to have less in stocks, but I’m not going to move everything out. What would you recommend instead? What investments do you recommend instead? You’re not picking a fight, J.D. You’re asking a question that is on the minds of all of your readers. I am grateful to you for asking it and thereby helping us all engage in a little bit more of an effort to figure this investing stuff out together. There is no one stock allocation that I can suggest everyone adopt. And there is no one non-stock asset class that I can suggest everyone move to when stocks are not a good choice. There are obviously lots of factors that come into play. You would never tell all of your readers to follow one allocation and it is not fair of you or anyone else to think that I might be able to do something like that either. What I say is that we all should evidence much more skepticism re claims that rebalancing is a good strategy than we have in the past, given the economic crisis we are living through today (which I believe was brought on primarily by the heavy promotion of Buy-and-Hold investing strategies). Rebalancing is staying at the same stock allocation at all times. Yet there are some valuation levels when stocks offer great returns at low risk and other valuation levels when stocks offer poor returns at insanely high risk. Why would you want to be at the same stock allocation in both sets of circumstances? Rebalancing simply does not make sense. The historical explanation for why it once was considered a good idea is that there was once research suggesting that the market is efficient — rebalancing would be the ideal asset allocation strategy if the market really were efficient). If you are saying that 65 percent stocks is the allocation that you think makes sense for you at times of moderate valuations, I would say that a stock allocation of perhaps 30 percent makes sense for you today (and 90 percent will make sense when we go to super-low valuation levels). My choice would be to put the money you moved out of stocks into TIPS or IBonds or CDs. That way you will have it to invest in stocks when the likely long-term return on stocks improves (that is, when valuation levels drop). Please understand that I am not trying to tell you what to do. It is obviously not my place to do that. I’m just a guy who posts on the internet, like you (the difference is that you have been about 500 times more successful than me and please understand that I believe that you deserve your success). I believe that you are sincere in your Buy-and-Hold convictions, J.D. I also believe that part of the reason why you hold those convictions is that you rarely hear them challenged. That’s because there is a Social Taboo today against saying the sort of things I say about rebalancing and about Buy-and-Hold in general. My hope is that in time (perhaps soon!) you will use your influence in the Personal FInance Blogosphere to overturn that Social Taboo. I am 100 percent confident that we would all be better off as a result. I don’t know everything there is to know about stock investing. Neither do you. Neither does anyone else. The usual rule that applies when that is the case is that we all post the best thoughts we can with good intent and we all are grateful that the friends we meet on the various blogs are doing that. We learn together. I want to see that Learning Together process take place in investing discussions too. For that to happen, we need to make those who don’t think rebalancing is a good idea as comfortable expressing their thoughts as those who favor rebalancing are comfortable expressing theirs. I want to help you and all your readers, J.D. I cannot do that with both hands tied behind my back. I respect your views. But I do happen to think you are wrong about this particular point. I’m happy to answer any questions. But I really think it would be a huge plus if some of the leaders in the Personal Finance Blogosphere could get together and issue a statement saying that they oppose the bans that apply today at all of the large discussion boards and at a number of important blogs. To make real progress on these questions, we have to welcome input from all points of the spectrum of opinion. My bottom-line response to your question is: I don’t want you listening only to me when forming your opinion re rebalancing. I know that, if signals were sent that we want to hear from people who don’t favor rebalancing, we would be hearing from many more people with that viewpoint. I know this because people who hold these views have told me that they are afraid to post. That’s very, very wrong. We all should want to change that, regardless of what particular investing views we happen to hold. How do you arrive at these adjustments? What information do you use to decide whether to convert 65% into either 30% or 90%? Thanks for your question, Carey. I hope I am responding in the right place. There was no “Reply” button up where your post appeared (because it as a response to an earlier reply). I follow Valuation-Informed Indexing, which is the opposite of rebalancing. The risk attached to stock investing changes with changes in valuation levels. There are times when stocks are super risky and there are times when stocks are no more risky than money markets. The goal of VII is to keep your risk level roughly constant. To do that, you must be willing to change your stock allocation in response to big swings in valuation levels (that is, you must be willing to NOT follow a rebalancing strategy). Since J.D. said that he is at a 65 percent stock allocation, I described to him an approach that would make sense for someone who believes that a 60 percent stock allocation is right at times of moderate valuations. That’s the 30/60/90 strategy. With that strategy, you go with 30 percent stocks when stocks are super risky, with 60 percent stocks when the risk is moderate, and with 90 percent stocks when there is virtually no risk. Again, the goal is to keep your risk profile (rather than your stock allocation) constant. The thing that tells you when to make the allocation changes is P/E10 (the price of the index over the average of the last 10 years of earnings). P/E10 is essentially the price tag of stocks. The fair-value P/E10 level is 14. When stocks go to a P/E10 of 25, they always crash. There is not a single exception in the record. Stocks MUST crash once they get to that level if the market is to continue to function. When stocks are priced below 20, they offer a strong long-term value proposition. When stocks are priced below 10, they offer an AMAZING long-term value proposition. When stocks are priced that low, the returns are off the charts and the risk is virtually non-existent. To understand why this works, you need to understand what it is you are buying when you buy an index fund. You are buying a long-term income stream. When you buy stocks at a fair price, you are buying an income stream of 6.5 percent real per year (that’s the average long-term return). Let’s make it 6 percent to make the math easy. What do you think happens when you pay three times fair value? You pay $3 for every $1 dollar of an income stream of 6 percent. That is, the return to you is 2 percent, (6 divided by 3). It’s obviously not as good to get a long-term return of 2 percent as it is to get a long-term return of 6 percent. So your stock allocation should be lower at times when the long-term return is set at 2 percent or less than it is when the long-term return is set at 6 percent or more. If you are willing to invest more heavily in stocks at times when they are paying good long-term returns and less heavily at times when they are paying poor long-term returns, you obviously are able to retire many years sooner than those not willing to do that. Please understand that I am NOT recommending short-term timing. No one knows where stocks prices are headed over the next year or two. This is LONG-TERM timing. It always pays off but it sometimes can take as long as 10 years to do so. The research shows both that short-term timing never works and that long-term timing always works (this is because stocks are set by investor emotion [unpredictable] in the short term and by the economic realities [highly predictable] in the long run). Thanks for the additional detail. I had a feeling you were talking about P/E10 but I wanted to find out for sure. There is certainly some appeal to the idea, but I like the simplicity of a set asset allocation glide path. Of course, time will tell if my thoughts change! One thing I disagree with is your use of the word rebalancing as a synonym for a fixed asset allocation. To me, any time you adjust your portfolio to match a target allocation, you’re rebalancing. Whether that allocation is different than it was 6 months or a year ago is irrelevant. In fact, people commonly change their allocation by increasing bonds as they get older. I still call that rebalancing. As an aside, I’m familiar with Wade Pfau from his postings on the Bogleheads forums. Small world! Good article. I also remember reading, though now I don’t recall where, that rebalancing every 2-3 years tended to outperform annual rebalancing, since it lets “winners” have a bit more of a run before you rein them in. Target date funds are another option for more hands off investors. But just make sure you keep an eye on expenses! Lifecycle funds do this automatically, so that’s one more reason to have them. Hear hear! A significant advantage of LifeCycle (a.k.a. Target Date) funds is that they re-balance for you and with consistency. Very good write up on rebalancing! I rebalance with new contribution throughout the year and also do annual rebalace at the end of the year. Rebalancing can be a good idea, but it can also be a bad idea at times. Lets consider the target retirement funds that do the rebalancing for you. Also, after the “collapse”, I left my funds invested in the same risky, volatile stocks that dropped 40 points in a couple months, and I still am invested in them today. I continued to buy shares (though much cheaper when the price crashed) and after a year I had gained all the money back from the “lost decade” and then some. Like Buffet says, you want to get in when everone else is getting out, more or less. This post looks extremely interesting but I’m not at the point that I can read it for comprehension without significant effort– in other words, I don’t yet know enough about the subject. I would like to come back to it a few months down the road though. I guess I’ll have to click on the whole “investing” keyword and see what surfaces. I have to admit I didn’t understand it either, which my comment below may prove. Does this make sense, or is it supposed to be 2%? Waiting until it gets to 20% above or below seems to be waiting too long… or possibly I just don’t understand the point here? Is it +/- 20% of total? I see it now – thanks Carey! Thanks for this great article. I’ve known that I should re-balance and never quite known how. I have generally rebalanced by adding more to the asset classes that needed beefing up but somehow thought that wasn’t quite right. It seems to work and I’m glad to read that is the suggested way to do it while still working. I’m just getting to the point in my portfolio where I am investing in more than one fund, and this explains re-balancing simply. Keep the investing articles coming! Thanks for the interesting and informative article! My husband and I have recently worked out a new asset allocation strategy for our ROTH IRAs. We plan to rebalance yearly, and this is great information to keep in mind. One thing to keep in mind, you should really consider your asset allocation for your entire portfolio, not for each account separately. You may only have one retirement account now, but at some point you may pick up a 401k or other account. To demonstrate my point, let’s say you want 60% in stocks and 40% in bonds. If you had $6,000 worth of stocks in your Roth IRA and $4,000 worth of bonds in your 401k, each account is not independently in balance but your overall portfolio is, so all is well. The really nice thing about this is you can take advantage of the fund choices in each account to get the best options available. In my case, I have a 401k and a Roth IRA. My 401k doesn’t have good bond fund choices, so I keep all of my bond portion in the Roth IRA. As long as my overall portfolio is balanced to my asset allocation, I’m in good shape. It’s important to rememember when Rob Bennett refers to “stocks” or “the market,” he is speaking solely about the S&P 500 Index. He absolutely loves Robert Shiller’s paper about PE10. About other academic studies regarding the benefits of rebalancing across loosely correlated asset classes? Not so much. And of course, while he’s quick to throw out numbers “proving” the superiority of his strategy, the one thing you’ll never see him do is show how his Valuation-Informed Indexing strategy has performed when backtested against buy-hold-rebalance alternatives such as The Coffeehouse Portfolio. a wonderful resource which shows results for various “Lazy Portfolios” in Excel format for the period 1972 to present. He absolutely loves Robert Shiller’s paper about PE10. I am a fan of both Bogle’s work and Shiller’s work. Some see a conflict between the two. I do not. My belief is that Bogle and Shiller go together like chocolate and peanut butter! Yikes. I actually got a bit sick to my stomach reading this post. There’s nothing wrong at all with your writing, and probably not with your financial advice either. But I don’t understand stocks or investing, and I’ve tried for years. I read blogs like yours and an occasional financial management book. I just don’t get it. I don’t understand how it works and I have no head for numbers at all. I’m very intelligent in other ways. I earn a six-figure salary, and all I do is live frugally and save stringently. I have no debt other than a mortgage. So my question is this: How can I find someone that I can trust, to advise me on investing? I don’t want to be condescended to. I don’t want it explained to me. I just want someone who is honest & upright to recommend what to do with my money besides shovel it into a savings account. Help! Rebalancing is the process of restoring a portfolio to its original risk profile. It may sound counterintuitive but sometimes when rebalancing a portfolio you have to sell those investments with high yields to buy more underperforming assets.